Carlsson granted the GM title! 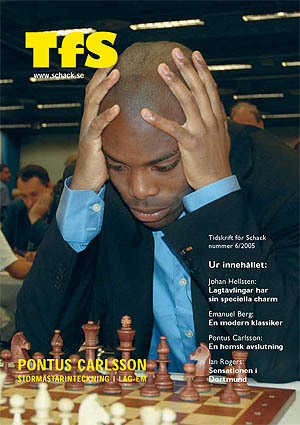 "I got some good news this week when FIDE awarded me the GM title so I am now the second black GM in the world not bad! I also spoke with Amon recently and he told me that he was going to Holland and play some. It was nice that he made his last norm so that we will soon be 3." Carlsson has a 2481 ELO, but he would have eclipsed the 2500 barrier at some point. Carlsson earned his 3rd GM norm in Spain and just returned from Turkey after participating in the European Cup. He has expressed an interest in playing in the U.S. by year's end.